Kathryn Ferry's new book is about the best years of the British Seaside Holiday, covering the period from 1870 to 1970. She begins in the era of the Victorian day tripper and ends with their descendents jetting off to Spain in large numbers. Her book captures the essence of the holiday experience from the excitement of the trip to the coast, the comforts or otherwise of board and lodgings, building sandcastles and holiday entertainment, both on the beach and elsewhere. The book begins with the journey to the seaside. The Victorian and early twentieth century holidaymaker usually travelled by train. You can feel the hustle and bustle of crowded excursion trains where the discomfort was matched by excitement and anticipation. Later the coach and then the car took over as the main means of going on holiday. This book then takes us through the various types of holiday accommodation that was on offer. The author explores the myth of the seaside landlady. She describes luxury hotels with palm court orchestras and asks if holiday postcards of overcrowded lodgings were based on fact. She also discusses the appeal of self catering and the caravan holiday. Kathryn Ferry then looks at the holiday camp from its origins at the Cunningham Camp on the Isle of Man to Billy Butlin and Fred Pontin. We then head for the beach and learn the history of sandcastles and rock pooling. All manner of holiday entertainments are covered, from donkey rides to the spectacle and excitement of Blackpool's Pleasure Beach. 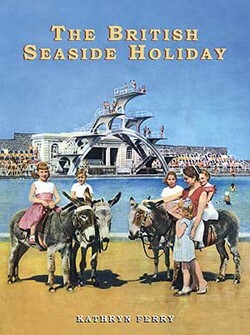 This book is a comprehensive presentation of the British Seaside Holiday. It is historically accurate and well illustrated. It is also a very good read. It will bring nostalgia for some, but is also an important historical record.